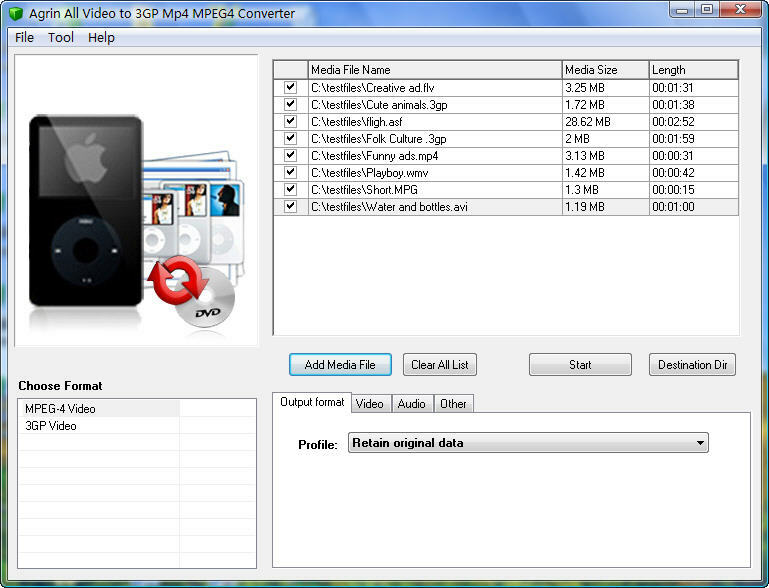 Agrin All Video to 3GP Mp4 MPEG4 Converter is the ideal tool to convert all video to 3GP,MP4. With this software, you could easily get 3GP,MP4.from so comprehensive video files. You will be amazed at its powerful functions. It can support converting videos files including AVI,WMV,MPEG,MPEG4,ASF,VOB,3GP,iPhone, MOV,FLV to 3GP,MP4 with best quality and fast speed. ...... To save time, you can batch convert once. You must feel like it after using it. The competitive price is accepted by the people and the easy-to-use interface is affordable by the people.It offers the trial version and free download for a try now! Qweas is providing links to Agrin All Video to 3GP Mp4 Converter 4.2 as a courtesy, and makes no representations regarding Agrin All Video to 3GP Mp4 Converter or any other applications or any information related thereto. Any questions, complaints or claims regarding this application Agrin All Video to 3GP Mp4 Converter 4.2 must be directed to the appropriate software vendor. You may click the publisher link of Agrin All Video to 3GP Mp4 Converter on the top of this page to get more details about the vendor.